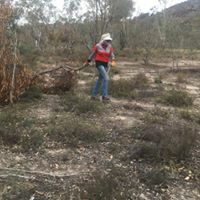 Join the Mount Taylor ParkCare Group for their monthly catch up as they work to protect and enhance one of the most popular reserves in South Canberra! Make sure you wear closed shoes and sunscreen, bring a hat, some water and a snack for afternoon tea! It has been an extremely dry year and the effect of the drought and hungry herbivores has seen a significant loss of native groundcover on Mt Taylor. The northern and eastern slopes are most adversely affected including the rocky grassy habitat of the nationally vulnerable Pink-tailed worm lizard. The annual weeds are (thankfully) holding the soil. Sadly for our thirsty wildlife, the large farm dam has been empty since last summer. Our work parties this year have been focused on erosion control and unauthorised trail closures. Southside Ranger Adam and Park Care Ranger Marty have been assisting with woody material to place across the trails. In the next year we are looking to work with Jasmine from PCS and the mountain bike community to resolve ongoing issues with illegal trail-making. We have identified an area where a trail network could be formalised well away from the ecologically sensitive areas. Thanks to successful lobbying by the Tuggeranong community (including Convenor Anne I’ons) some funding was provided in the ACT Budget to improve access to Mt Taylor off Sulwood Drive (to the Mannheim gate) and formalise the car parking. We are hoping for a more permanent and safer solution in the longer term. As part of this announcement, funds were also provided to upgrade the eroded fire trail leading from the Mannheim gate to the popular southern walking trail. We have met with the Parks Project team and District Rangers to discuss the upgrade and the condition of the trails across the mountain. This year we assisted Shirley from the Mt Taylor Challenge Group with a community project to enhance the Broadcast box at the summit. We provided Geoff, the graphic artist (@Graffikpaint), with photos of Mt Taylor wildlife and wildflowers (all taken by Park carers and other walkers) for the design concept and managed the Works approval process with the NCA. The artwork looks amazing and well worth the walk to check out the walls, a huge improvement on the old graffiti. Our final meet for the year was our annual summer Butterfly walk with local expert Suzi Bond and emerging expert, Ace Frawley. Despite the squally morning, little patches of warmth and sunshine saw a few beauties take flight. We were delighted to encounter butterfly royalty - the Dark Purple Azure as well as Meadow Argus, Painted Lady, Amethyst Hairstreak, Common grass blue, Fiery Copper,Chequered Copper, and the pupae of the Bronze Flat on Brachychitron. We are learning so much from Suzi about the key plants for specific butterfly species including climbing mistletoe, cherry ballart, brachychiton, lomandra filiformis (small) and Busaria spinosa.